What do you think of when you hear the word gout? Do you think of infection? Swelling? An archaic disease? 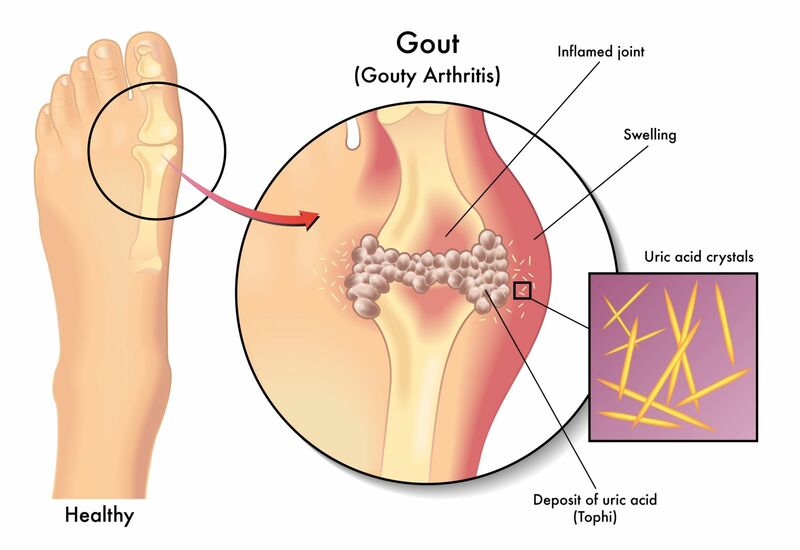 Gout is a condition in which a biproduct of protein breakdown called uric acid rises to high levels in the body and then is deposited in certain joints from time to time. We call these episodes ‘flare ups’ and for some people they occur a few times per year, others maybe only a couple times in a lifetime. The reason that some people develop painful symptoms of gout is due either to the body under-secreting the uric acid (doesn’t get rid of enough) or over production (makes too much) of it. Gout does often have a familial pattern – meaning that if your parent(s) have a history of gout, you have a tendency to develop it as well. In the feet, gout presents most often as pain in 1 joint which seems to develop out of nowhere. There is not typically a recollection of injury or even overuse. Rather people wake up with pain, redness and swelling around the affected joint. We see this most often in the big toe joint or in the ankle. These symptoms, while severe, are typically limited to a few days or a week and resolve once the uric acid has decreased and inflammation has resolved. This leaves you wondering – what was that? Especially if you did not seek treatment or were not able to get into the doctor before it resolved. Why do some people get it and some do not? If not due to a predisposition genetically, some medications can increase the risk of developing gout. Diuretics are one of those types of medications. Diets high in meats and alcohol can also cause gout. High blood pressure, diabetes, kidney disease and heart disease also increase risk. Gout occurs more commonly in men between the ages of 30 and 50 and is less common in women. In women, the condition typically presents post-menopause. Where else can it happen? There are some atypical cases of gout, where the ‘classic presentation’ as we call it is completely abandoned. Gout has been known also to attack tendon tissue, particularly in the achilles tendon. This may present as a bad, sudden start of pain to the tendon in the back of the ankle-often without any known cause. While gout typically attacks the great toe joint or the ankle, it can also affect smaller joints. There are even some cases within the smaller joint in the big toe (called the interphalangeal joint) – one even caused a depression in the toenail and the gout crystals even began to cause an opening in the skin under the nail bed. This was one unexpected presentation seen by yours truly! What else can joint pain be? Joint pain has a variety to causes. Rheumatoid arthritis, psoriatic arthritis, osteoarthritis are all possible reasons for joint pain – though these conditions affect more of a variety of joints and in rheumatoid arthritis it typically occurs bilaterally (in both right and left sides) at the same time. There is also a condition called pseudogout or calcium pyrophosphate deficiency. This condition also causes pain that is seemingly out of nowhere, but tends to affect the smaller joints within the toes and hands. It is also due to a crystal deposition in joints, but the crystal is calcium pyrophosphate rather than uric acid. Gout is often suspected based on the presentation of your symptoms and location it is seen. To confirm without question that gout is the cause of pain there are two primary tests that can be performed. The first is a serum uric acid test. This is a test done from a blood draw. The uric acid level in the bloodstream has a ‘normal’ amount and if the blood sample demonstrates more, this identifies gout. However, the tough thing about the blood test is that often times it is ordered when the affected individual is having an active attack of gout and the uric acid will be normal in the blood streams due to the fact that it has moved into the joints by this point. The second way to diagnose gout is with an aspiration biopsy. This involves drawing out the joint fluid in the affected area with a needle and sending the fluid to be assessed with special testing to a pathologist. This often will provide a very clear and reliable diagnosis. The challenge with this method then typically is due to the need for a needle poke in the already painful area. However, we can numb up the area and removing the fluid helps improve pain faster and typically a steroid injection can be done immediately after the fluid is removed. This also improves the condition very quickly. Will I keep having attacks? The key to reducing your risk of gout attacks is being aware of the cause of YOUR tendency to have attacks and preventing them. Typically, consultation with a rheumatologist helps to identify the most important causes of the condition to address. In some instances, medication is required to manage the levels of uric acid in your body. While another medication does not sound appealing to most people, avoid future attacks has more benefits than the obvious. The less gout attacks an individual has, the less likely a person could develop advanced joint damage and pain or have a need for surgical intervention ultimately. In most cases, the pain due to gout is so severe that these people make a point of getting to a doctor as soon as possible! The redness, swelling, extreme pain and warmth to any joint is a concern for conditions other than gout (such as infection) and most people are acutely aware that they need to be seen soon. If you have had a bout of pain that you believe may have been gout, I could recommend going to see a doctor to have the blood test performed to check for gout. That being said, most people will typically wait until another attack occurs and at that time will be seen so that the diagnosis can be confirmed and treatment can be initiated.